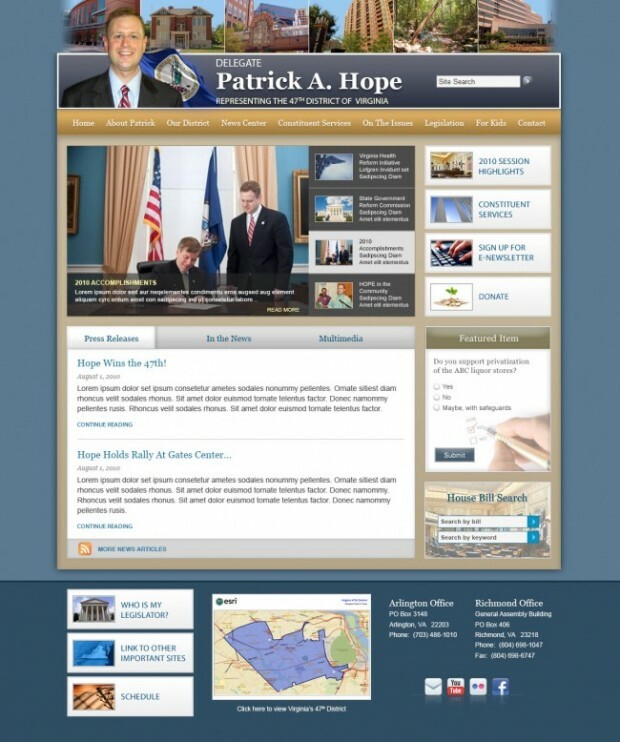 Hope for Virginia – Virginia Delegate Patrick Hope Launches a new Web Development Group powered website. In a new wave of web design it is clear that less is more – meaning less clutter and more space to emphasize crucial elements on the site. Delegate Patrick Hope representing Arlington, Virginia launched its new website with a slick slideshow, integrated Facebook, and YouTube feeds while integrating a solid new social blogging platform. The site doesn’t look like every other delegate’s website with blended district images instead like the rest of the site; the banner is clean, bold, and to-the-point. Virginia’s 47th district constituents won’t have to look hard for breaking information affecting the area or become a Facebook follower. The new website features a prominent “media” section as well as a section dedicated solely for announcements and events from the Delegate. The site has a personal touch that offers immediate sign up service for email newsletters and direct mail and the site makes it easy for constituents to donate.